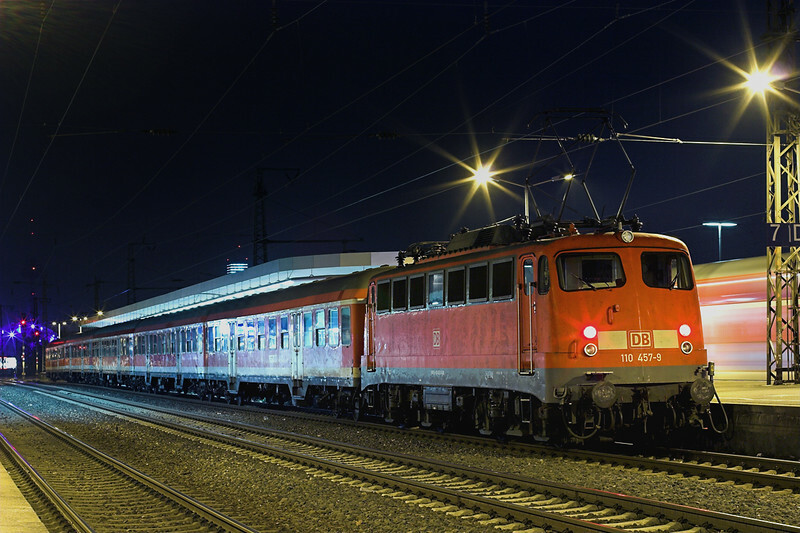 Welcome to the latest Railwaymedia Blog, this being edition 40 which will be a quick résumé of my wanderings over the last month. It seems much longer than that since my three day visit to Germany; when I update my New Additions section by removing those trips that are over a month old it's often with a sense of amazment that it was so long since I had taken them but, occasionally, it works the other way round and journeys out seem to be months ago rather than a few weeks. Anyway, over the last four weeks since edition 39 I have managed to get out a few times with trips to Scotland and Warwickshire, as well as some more local North West pictures taken in the last week. Both the first two days were arranged round my, as usual, visits to Wetherspoons I had not previously visited in that days chosen area. Currently I have been to 367 out of the 877 open branches. Anyone interested in this as a hobby is recommended to John Adams invaluable List. To those, and I know there are many, who either don't like Wetherspoons or would think trying to visit them all is worse than trainspotting: well I have found I am visiting many places I wouldn't normally stop off at. There is of course a trade off between the number of pictures I take and the number of pubs I visit, but with care it can work to my benefit. The Real Time Trains website has become a perfect tool enabling me to get back to the station in time to photograph freight trains I otherwise wouldn't have known were running. This one at Leamington is a case in point. Warwickshire, my second main trip of the month, started off later than normal as I had to put the car in for its MOT (with the proviso I would pick it back up the next day), so it was dinner time before I reached Stratford-upon-Avon. Two reasons for visiting here: first of course for the Wetherspoons, but also for my first picture of a Chiltern 172. As I have mentioned previously these used to be hard to see being confined to just a handful of peak hour journeys. They are now the staple traction for the Marylebone to Stratford trains making them much easier to photograph. 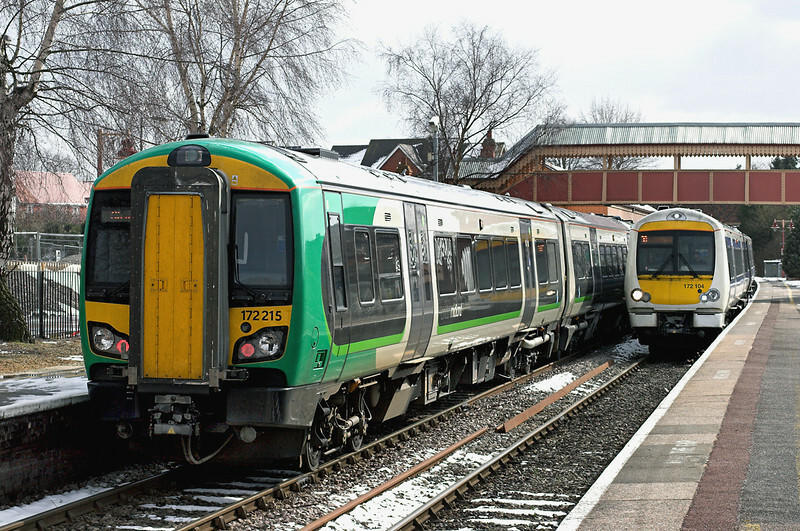 You can even get a side-by-side comparison with gangwayed London Midland members of the class. A week or so earlier I had headed up to Lanarkshire for pretty much the same reasons, Scotland being chosen as it had the best forecast. 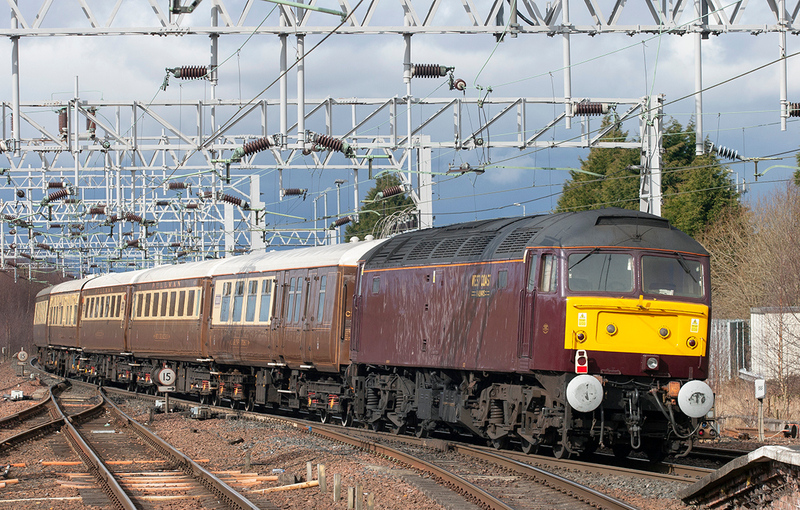 Needing to visit Lanark, Wishaw, Motherwell, Coatbridge and Cumbernauld (obviously a tour of the areas highlights...), I first called off at Carluke as a few freight trains were booked through. Two of those turned up as light engines, a DRS 47 heading south from Motherwell after dropping off some container wagons in the former MPD and a Freightliner 90. The third working was the regular 92-hauled Mossend to Hams Hall train. 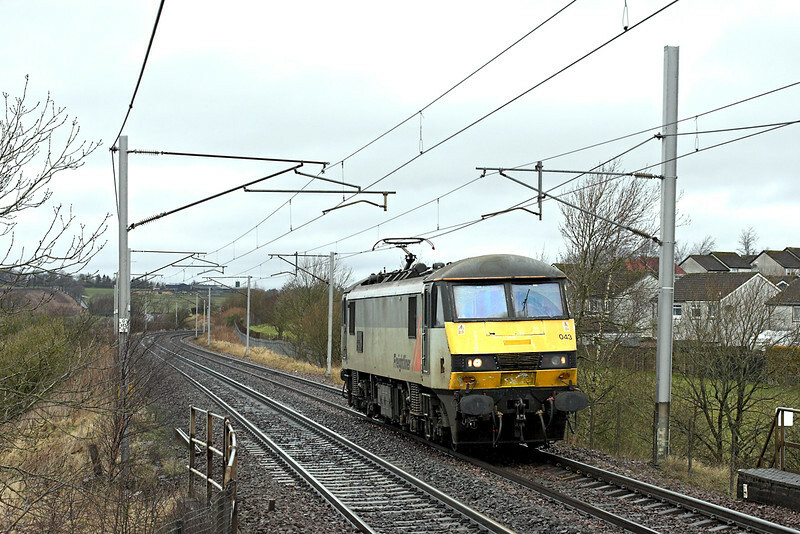 Carluke is quite a good spot for southbound trains mid-morning, though the weather could have been better. Eventually the weather did start to improve and I managed to get a couple of almost sunny unit shots at Motherwell-I am always on the look out for more shots of the 318 and 320 EMU's, the latter have only been regular performers south of the Clyde for the last year or so since the Airdrie to Bathgate line reopened. Not having checked Real Time Trains, the Statesman was a bit of a suprise heading north at Motherwell in a nice interlude of sun, though I could only get a shot of the rear. 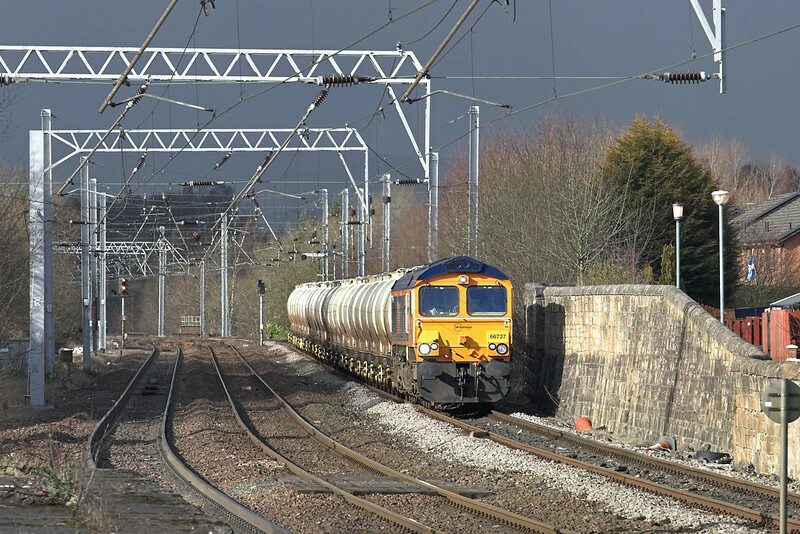 Having an hour at Coatbridge to visit the Wetherspoons there, I had a bit of flexibility available to hang around for any freight trains that were due. I got a northbound coal before I left the station and a southbound Freightliner coal on my return. The GBRf operated Fort William to Blythe Alcan working was sat on the loop line some way away, presumably in order to minimise noise for the adjacent houses. The light was perfect so I had to go to maximum zoom and crop the picture. 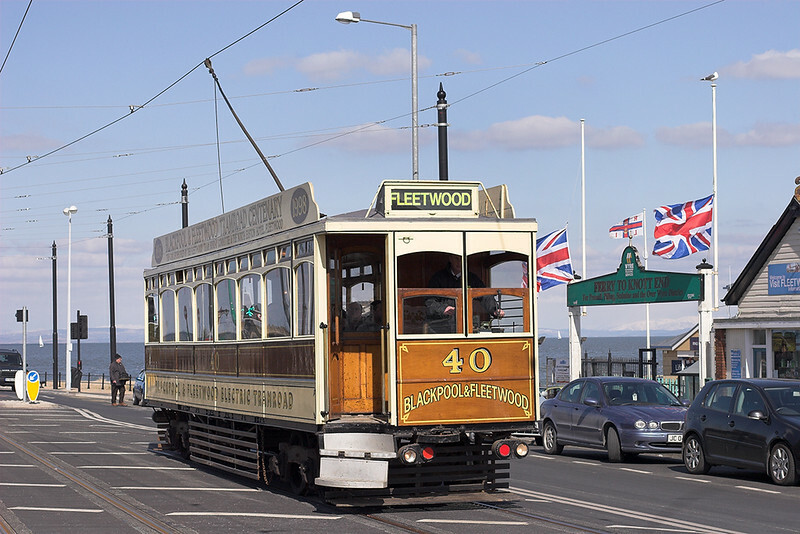 The new season has started on the Blackpool Tramway, commencing with the 4 day Easter Bank Holiday weekend. Operation of the 'Heritage' Tram Service is slightly different this year in that it is no longer operating every weekend, but when it does operate (Bank Holidays and School Holidays) more trams will be being operated. The timetable is HERE , and features two journeys a day through to Fleetwood. Two Heritage Trams are in operation all day working the timetable with two of the Balloons operating extra trams between Pleasure Beach and Bispham, one out in the morning and a different one in the afternoon. Open-top 706 worked in the morning on Good Friday with Bolton 66 and Blackpool 'Box' 40 on the scheduled trips, number 40 performing the first of the full length runs to Fleetwood, seen here during a brief stopover by the Ferry Terminus. A short break in London with work this week proved productive, again down to Real Time Trains. A quick dash from Euston to Kentish Town West got a picture of a slightly late running Bristol to Felixstowe Freightliner and 20 minutes at nearby Camden Road saw 90047 passing on one bound for Basford Hall. Despite the website though 66743 on a follwing one was a complete surprise at Highbury and Islington. I quickly nipped to Haggerston on the East London line before retracing my steps back, but direct via Highbury, for the Victoria Line. Not bad for under two hours. One interesting thing was the charge to my Oyster Card. Many people, myself included, have got 'stung' by Oyster not recognising the type of odd journeys enthusiasts tend to make. On this occasion though I was pleasantly suprised as my walk from Kentish Town to Kentish Town West counted under the 'Out of Station Interchange' rules meaning, despite my 15 minutes there and the time spent at Camden Road, I only got charged the £2.10 Zone 1 and 2 price for the full journey using a tube, a 10 minute walk and 3 trains as the whole journey was under 90 minutes in total. Today I had chance to nip early to Lancaster as the weather was forecast clear. 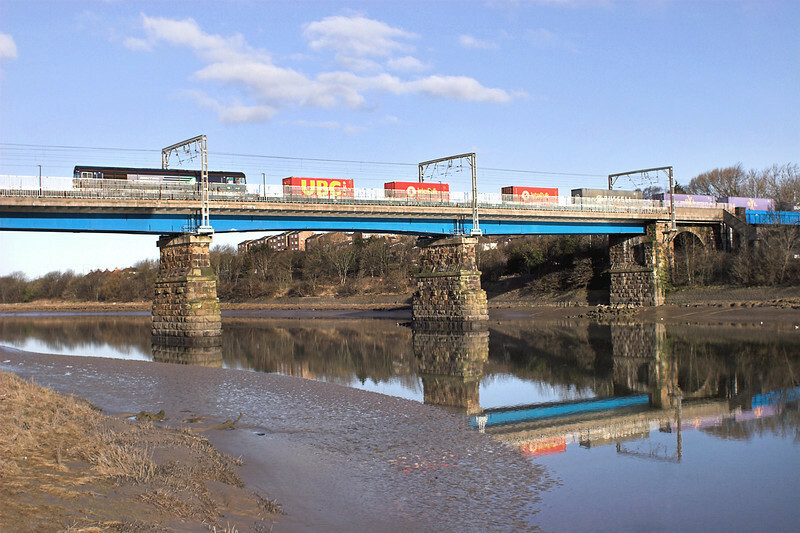 It is the first time I have photographed trains crossing the bridge over the River Lune. I am not sure why but I must now do the evening shot from the other side soon. I hoped to get the Crewe to Sellafield flask train there, but it was running a bit early. There were quite a few clouds bubbling up but fortunately 66301 on the daily Coatbridge to Daventry train came during a spell of morning sunshine. I called off at Warrington around dinner time for the ususal procession of trains on the bottom line to and from Fiddlers Ferry. 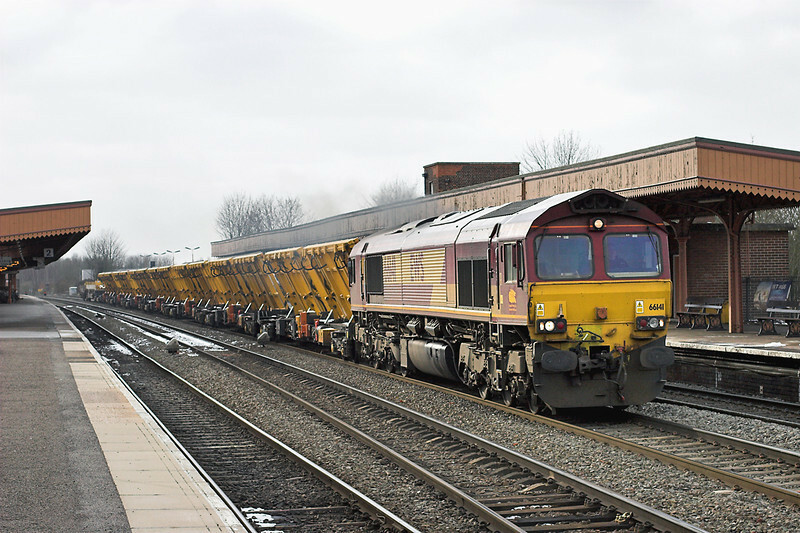 They must have been having a few problems at the Power Station with unloading as the morning Freightliner came out over an hour late and the usual dinner time class 60 working took over 4 hours to get there and back. I have covered the shots at Arpley on here many times so if you wish to see any of the pictures they can be found HERE. Tomorrow I may end up in Manchester and if time permits will go and see the new Metrolink extension to either Droylesden or Rochdale. Next week I shall be busy with an All Line Rover, the first time I have bought one of those. 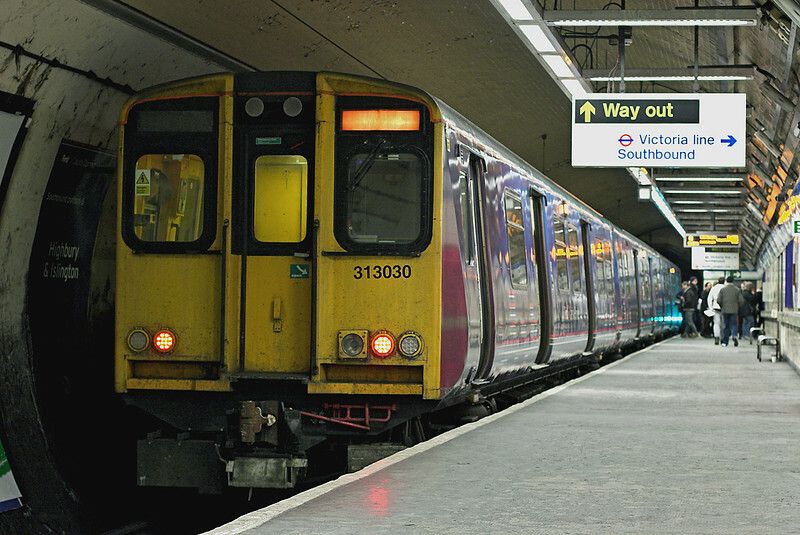 I will be principally covering as far as possible lines I have not done before, or places I haven't been for years, so pictures will probably be limited to station shots at the end of branches or grabbed shots whilst waiting for trains. There is certainly unlikely to be any updates to my site or this blog for the next 8 days as I shall be rather busy! Thanks for reading, as always I will leave you with my picture of the bizarre or unusual. 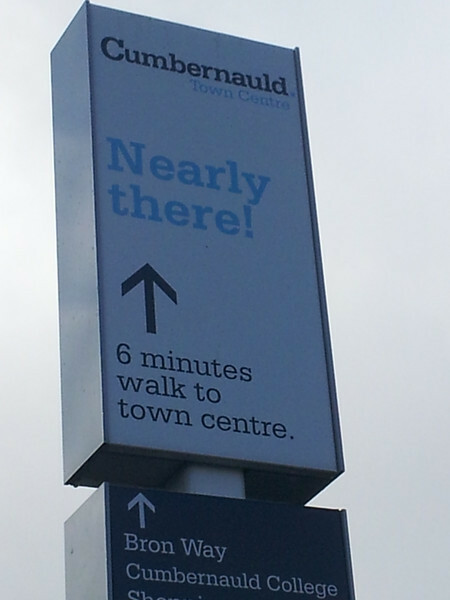 Visiting Cumbernauld the other week for only the second time ever (I have no further plans to revisit), it was useful there was good signage from the station through the housing estate to the 'Town Centre'. The excitement on realising I was almost there though was somewhat underwhelming!